The hardest part about hosting these link parties for me is trying to figure out how to introduce them each week. I’m going to try something new this week and we’ll see how it goes. So many people are overwhelmed by the amount of work I have to do each week to manage my allergies, cooking from scratch, working a full-time job, and writing this blog. The truth is I couldn’t do it if I hadn’t worked out a few tips and tricks along the way. And, some weeks are better than others. So, each week I’m going to share with you one of my efficient cooking tips. Hopefully, you’ll find something that works for you! The top cooking shows all recommend that you salt or brine your meat the day before you cook it. I don’t know about you but I wouldn’t want to store open meat in my refrigerator even if I had the space for it. I usually buy whole chickens in bulk whenever they’re on sale—up to 4 at a time! I take them home, cut them up, and package them in vacuum seal bags in my freezer for when I need them. I have a second-hand chest freezer and I recommend them to anybody that wants to cook from home regularly. Freezer zipper bags would also be fine. I do legs and thighs, breasts, and stock parts in separate bags. I don’t eat red meat but this process will also work for it as well. Before I seal up the bags, I salt the chicken pieces (except for the stock parts). 1/2 teaspoon of salt per pound is the recommended amount. (It is possible to over salt.) You could add spices as well at this time if you have specific plans but I usually just stick with salt. At this point you can seal up the bags and toss them in the freezer. All of this prep work pays off when you thaw out your perfectly salted meat. As it thaws, the salt gets into the meat and helps flavor it but also keeps it moist and tender. You do not need to add more salt before cooking. The readers have spoken! 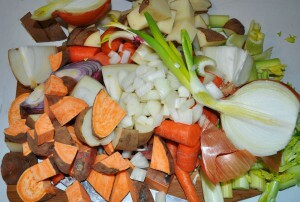 The most popular post was from Elle at A View From The Cottage with Veggie Stock. This post has been pinned. Congratulations to Elle! I hope she continues to join the link party. This entry was posted in Art, Autré Chose, Link Parties, Recipes, Tips and tagged allergy, corn free, corn-free everyday, crafts, healthy living. Bookmark the permalink.